This case study was released in March 2013, prior to the merger of Hitachi Plant Technologies with Hitachi, Ltd. The company is renamed as Hitachi, Ltd. Infrastructure Systems Company (Sri Lanka Branch Office). 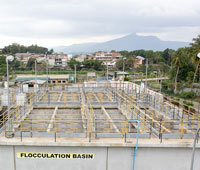 In 1997, the demand for water in Sri Lanka's Central Province, Greater Kandy, had far outgrown the amount of clean water that was supplied by the existing water treatment plants. The escalating water shortfall within the city of Kandy and in the northern part of Greater Kandy was particularly worrying. Furthermore, even for districts with water treatment facilities, the supply of water had to be rationed to certain days and hours due to supply capacity restrictions. The irregular access to clean water supply meant that crucial operations of the healthcare and tourism industry were greatly impeded and the livelihood of many Sri Lankans was affected too. A pressing need for an advanced water treatment system to meet the growing demand for clean water of the population was called for. In view of Hitachi Plant Technologies' expertise in building advanced pump systems projects, the company, together with Taisei Corporation, was selected by the Sri Lankan government to construct an advanced water treatment system facility. In this video: Mr P.H. Sarath Gamini, Project Director, National Water Supply and Drainage Board (NWSDB) and Mr. M. S. Pinto, Chief Engineer, Hitachi Plant Technologies Ltd. (Sri Lanka), talks about the challenges and solutions of constructing water treatment system in Kandy City.